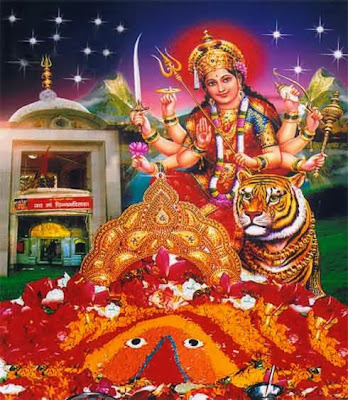 Goddess Raktadantika is a fierce form of Mother Goddess Shakti. Raktadantika means one who has blood on her teeths. Rakta means blood and danta means teeth. She appeared to kill demon Veprachiti. Her story is mentioned in the Durga Sapthshati. Goddess Raktadantika is part of nine goddess list found in certain puranas. The nine goddesses are Maha Lakshmi, Maha Saraswati, Chamunda Devi, Yogamaya, Rktadantika, Shakumbari, Brahmari, Durga Devi and Chandika. Veprachiti demon created havoc in the universe. There was death everywhere he went. Cries of children, men and women filled the air. No warriors among humans and demigods could stop the demon. Finally, Mother Goddess Durga appeared on the battlefield. She annihilated the demon army. She then pulled the demon towards her mouth and crushed him between her teeth. The demon could not escape from her powerful jaws. Not a single drop of blood from the demon fell on the ground. She then gulped the demon and saved the universe.